Will Grigg's penalty helped Wigan come from behind to claim a point at Championship strugglers Bolton. Will Buckley put the hosts in front at the University of Bolton Stadium with a smart back post finish from Pawel Olkowski's cross. However, Grigg levelled for the visitors from the penalty spot before the break after Jack Hobbs fouled the Northern Ireland international. The Latics went closest to a winner, but Christian Doidge's goalline clearance denied Lee Evans with time running out. Paul Cook's side also went close to a derby victory when Josh Windass found the side netting with a shot after the hosts had failed to clear their lines. The result sees the Trotters climb a place to 22nd - but they are now winless in their last 10 Championship matches amid financial problems that saw Phil Parkinson's squad not paid their November wages as scheduled on Friday. The Latics remain 15th, but Grigg's goal meant they avoided a club record eighth successive away loss in the Football League. "Everyone in the ground, apart from two people, thought Hobbsy's [Jack Hobbs] challenge wasn't a penalty. "It was a shame because I thought we played well until their goal. We felt sorry for ourselves for a little while after that injustice. "When you don't get paid and you are going to work, you'd probably be pretty demotivated. But the lads put it to one side and I am very pleased we put in that performance." "I'm pleased with the point. It was always going to be a difficult game as Bolton came into the game under pressures that go on in football. "Could we have converted one or two of the good chances we created? Possibly, but at least we take a point away with us. "The biggest credit I can pay the lads is that the disappointment of going behind didn't affect us. And that was important." Match ends, Bolton Wanderers 1, Wigan Athletic 1. Second Half ends, Bolton Wanderers 1, Wigan Athletic 1. Substitution, Wigan Athletic. Joe Garner replaces Josh Windass. Offside, Bolton Wanderers. Joe Williams tries a through ball, but Craig Noone is caught offside. Attempt missed. 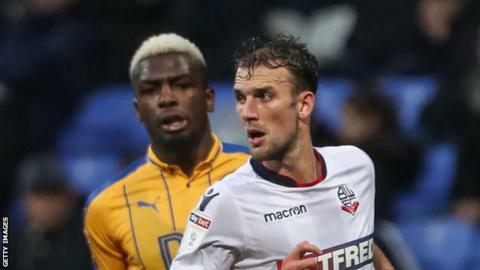 Christian Doidge (Bolton Wanderers) header from the centre of the box misses to the right. Assisted by Craig Noone with a cross following a corner. Corner, Bolton Wanderers. Conceded by Sam Morsy. Attempt blocked. Mark Beevers (Bolton Wanderers) left footed shot from the left side of the box is blocked. Assisted by Jason Lowe with a headed pass. Attempt blocked. Christian Doidge (Bolton Wanderers) header from the centre of the box is blocked. Assisted by Craig Noone. Corner, Bolton Wanderers. Conceded by Cedric Kipre. Attempt missed. Reece James (Wigan Athletic) right footed shot from the right side of the box misses to the left. Assisted by Josh Windass. Corner, Wigan Athletic. Conceded by Christian Doidge. Corner, Wigan Athletic. Conceded by Craig Noone. Corner, Wigan Athletic. Conceded by Joe Williams. Substitution, Bolton Wanderers. Yanic Wildschut replaces Sammy Ameobi. Josh Windass (Wigan Athletic) wins a free kick in the attacking half. Pawel Olkowski (Bolton Wanderers) is shown the yellow card for a bad foul. Foul by Pawel Olkowski (Bolton Wanderers). Attempt blocked. Josh Magennis (Bolton Wanderers) right footed shot from the centre of the box is blocked. Assisted by Joe Williams. Attempt missed. Joe Williams (Bolton Wanderers) right footed shot from outside the box misses to the left following a set piece situation. Christian Doidge (Bolton Wanderers) wins a free kick in the attacking half. Substitution, Wigan Athletic. Callum McManaman replaces Gary Roberts. Substitution, Wigan Athletic. James Vaughan replaces William Grigg. Substitution, Bolton Wanderers. Josh Magennis replaces William Buckley. Craig Noone (Bolton Wanderers) wins a free kick in the attacking half. Offside, Wigan Athletic. Nathan Byrne tries a through ball, but Josh Windass is caught offside. Corner, Bolton Wanderers. Conceded by Kal Naismith. Attempt saved. Josh Windass (Wigan Athletic) right footed shot from the left side of the box is saved in the bottom left corner. Assisted by Gary Roberts.